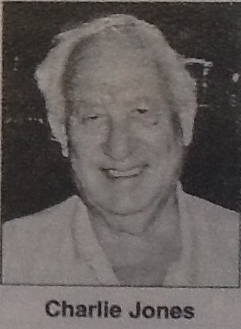 Charlie is remembered for his performances over many years at the Stage Door and later the Stage Door Theatre Restaurant and the Townsville Choral Society’s Theatre Restaurants. He was an accomplished actor, singer, and comedian, especially when accompanied by his wife Muriel for their Pearly King and Queen old-time music hall numbers. Charlie was born in the Old Kent Road in London, the son of a Cold Stream Guards’ veteran of the Boer War. The youngest of seven children. He joined the RAF in World War II and served in North Africa, Palestine, and Italy. He was demobbed in 1946 and the next year he met and married Muriel De Swarte in London. He worked on the London Trams and then as a double-decker bus driver. Soon after the birth of their two sons Charlie decided his future lay in Australia. He left his family in England while he found a job and home in Australia. In 1951 he joined the RAAF and Muriel and the two boys followed. He was posted to the Garbutt air force base in Townsville where he worked as a barman at the Sergeants’ Mess until leaving the air force. He joined the Townsville Fire Brigade where is most unforgettable memory was the great fire at the Townsville Bulk Sugar Terminal in 1963, when he and other members of the Brigade fought the blaze for days with few breaks. Charlie was a voracious reader, especially science fiction, and when he retired he ran a second-hand bookshop. With the boys grown up, Charlie and Muriel left Townsville for Sydney for a short time from 1972, however, they returned in 1974 and got back onto the stage. Acting in and directing shows at the Stage Door Theatre in its early days, their talents made them a natural choice to join the founding troupe of the Stage Door Theatre Restaurant, and they performed there from 1979 to 1988. Following the transfer of the theatre restaurant to the Gold Coast they both joined the Townsville Choral Society where they appeared in many musicals, theatre restaurant productions, and sang in the choir. Muriel played Agnes in the Townsville Independent Players production of “Wanted – One Body” which commenced on Sat 30 Dec 1967. 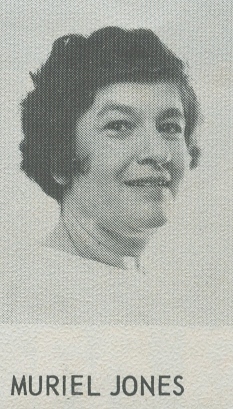 Muriel directed the Townsville Independent Players production of “The Owl and The Pussycat which commenced on Fri 29 March 1968. Charlie was Properties and Stage Manager. Muriel played Sister Maria in the TPI production of “Seven Nuns at Las Vegas” which commenced on Fri 17 May 1968. For TIP’s production of “Zow – Whaam- Kapow” Muriel did the costumes and Charlie was noted in ‘Special Thanks’. TIP’s production of “Out Of The Crocodile” was directed by Muriel commencing on Sat 26 July 1969. Muriel played Victoria Pugh in “Best Laid Plans” commencing on Sat 20 Sept 1969. Charlie played Meadows in the TPI’s Queensland Premiere production of “Loot” which commenced on Fri 16 January 1970. Muriel directed the production of “There’s a Girl In My Soup” which commenced on Sat 21 March 1970. She played Lola in the production of “Come Back, Little Sheba” which commenced on Sat 29 Aug 1970. and she played numerous parts in “Let it All Hang Out” which commenced on Thurs 31 Dec 1970. Muriel directed the production of “Busy Body” which commenced on 31 Dec 1971. On returning to Townsville from living in Sydney Muriel played Mrs. Banks and Charlie played Victor Velasco in the Stage Door Theatre production of “Barefoot in the Park” which commenced on Sat 6 Sept 1975. Muriel played Major Danvers-Bishop, W.R.A.C. in the production of “No Time For Fig Leaves” which commenced on Sat 4 Sept 1976. Charlie helped with set construction and design. Beatrice Chambers was played by Muriel in “Norman, Is That You?” which commenced on 31 Dec 1976. Charlie again assisted in set construction. Charles Jones (Charlie) directed the Stage Door Theatre production of “The Girl in the Freudian Slip” which commenced on 26 Feb 1977. Charlie played Dr. Morrissey in the production of “Send Me No Flowers” which commenced on Sat 25 June 1977. Muriel directed “Sunday in New York” which commenced on Sat 22 Oct 1977. Charlie assisted with set construction. Charlie again assisted with set construction and Muriel assisted back stage for the production of “How The Other Half Loves” commencing on Sat 31 Dec 1977. In “The Gingerbread Man” Charlie played Jimmy Perry and Muriel played Evy Meara with the season commencing on Sat 25 Feb 1978. Charlie was cast as Speed in the production of “The Odd Couple” which commenced on Sat 13 Sept 1978. He also assisted with set construction. “Oh,Mamma! No, Papa!” was directed by Muriel and Charlie played Dr. John F. Bolt which commenced on Sat 3 Mar 1979. Charlie again assisted with set construction. In “The Sound Of Murder” Muriel played Miss Forbes. The production commenced on Sat 4 Aug 1979. Charlie again assisted with set construction. In a Stage Door Theatre musical production of a pantomime “Cinderella” Charlie played Baron (Cinderella’s Father). The production was at the Townsville Civic Theatre and commenced on 30 Nov 1978. Charlie also did set construction.